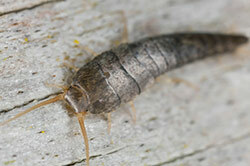 Silverfish are chewing insects and general feeders. They prefer carbohydrates and protein. In your house, they find all they need in minute amounts of flour, dried meat, rolled oats, dried beef, flour, starch, paper, gum, cotton, linen, rayon, silk, sugar, molds and breakfast cereals, paper and even glue. They can survive long periods, sometimes over a year, without food. One little silverfish is no problem. Two may start a population. If the numbers get high, silverfish can become pests, chewing and despoiling foods, munching at the glue behind wallpaper or in books.